With the 2016 NFL combine officially in the books, I've decided to take a closer look at the prospects the Patriots took a closer look at throughout the week in Indianapolis. Here's a position-by-position breakdown of the Pats interviews from the combine. Many expected the Patriots secondary to be the team's achilles heel in 2015, but it instead emerged as a strength due to breakout seasons from Logan Ryan and Malcolm Butler. However, both young corners are entering contract years. It's unlikely the team will be able to keep both around beyond this season, especially with Jamie Collins, Dont'a Hightower and Chandler Jones all also entering their contract year. With that in mind, it would make sense to add another capable body to a young rotation that also contains second year players Justin Coleman and Darryl Roberts. The long list of defensive backs interviewed by the team this week is headlined by two players who are widely projected as Day 2 talents: Mississippi State's Will Redmond and Baylor's Xavien Howard. Some in the scouting community believe that Redmond could have been a first round pick if not for an October torn ACL that sidelined him from the combine workouts. 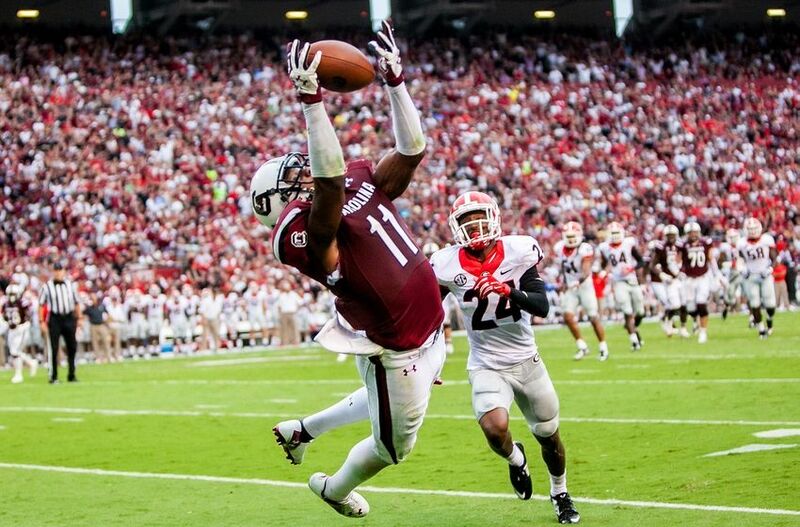 Redmond's lack of prototype size (he was 5'10" and 183 pounds at the combine) have some projecting him as a slot corner in the NFL, but he flashed the ball skills and elite athleticism (4.38 40 time, 35" vertical leap, 6.50 3 cone drill recorded last summer at MSU) to thrive in that role at the next level. Baylor's Howard had no restrictions on his combine workout, putting up a respectable unofficial 4.53 40 time and 10'2" broad jump. At 6'2" and 200 pounds with long (31 1/4") arms, Howard is a big corner tailor-made to play the Patriots preferred press man coverage. His size and length make him capable of matching up against big, explosive receivers, which could make him a nice complement to the shifty, athletic Butler down the road. There's no questioning his college production, as he held quarterbacks to a stingy 31.8% completions on throws into his coverage. Neither Howard nor Redmond is likely to still be on the board for the Patriots if they use their second round pick on another need, but the team could add a developmental prospect like Georgia Tech's D.J. White or Samford's James Bradberry later in the draft. White has fallen a little under the radar in a fairly deep cornerback class, largely due to his lack of prototype size (5'10", 188) and eye-popping athleticism. However, the collegiate team captain has three years of productive play on tape, and answered some questions about his athleticism this week with respectable workout numbers, including an explosive 11'0" broad jump. Bradberry is very much a raw work-in-progress, but he has the size (6'1", 209) and length (a left tackle esque 33 3/8" arms) to develop into a press corner or even a Byron Jones-type of safety/corner hybrid to use against tight ends. Bradberry's combine performance hinted at his athletic potential, as his top 10 showings amongst defensive backs in the broad jump (10'4"), 3 cone drill (6.91) and 60 yard shuffle (11.49) were all very impressive given his size. While cornerbacks were the Pats primary focus on the interview circuit last week, they did dip their toes a little bit into this year's safety class as well. Miami's Deon Bush has enough physical talent to be a Day 2 pick, but his inconsistent 2015 film suggests that he belongs as a developmental Day 3 pick who would at the very least contribute immediately on special teams. He projects as an "in-the-box" safety at the next level, where his physicality (5 forced fumbles in 2014) would be a plus. A sexier name amongst this position group is USC hybrid safety/linebacker Su'a Cravens. Most evaluators seem to be settling on Cravens eventual NFL role being that of a hyper athletic dime linebacker in the mold of Deonne Bucannan or Marc Barron, each of whom were first round picks as collegiate safeties. Cravens has received a little first round buzz, but it seems to be more likely that depth at other positions pushes him into the second round, where he could be an intriguing value pick if he falls all the way to 60. A lack of depth at offensive tackle proved to be the Patriots achilles heel in 2015, as neither Marcus Cannon nor Cameron Fleming were capable starting options once Nate Solder was lost for the season to a torn biceps. Solder should be back fully healthy this year, but with fellow starter Sebastian Vollmer set to turn 32 prior to the season and entering a contract year, it could be time to invest in the future at this all-important position. The Pats started this process at the Senior Bowl, where they met with Day 2 prospects Joe Haeg (North Dakota State) and Le'Revan Clark (Texas Tech). They continued their preliminary work at the combine, meeting with LSU's Jerald Hawkins and South Carolina's Brandon Shell. Hawkins is a prospect with some clear physical talent (he started all three of his seasons in the SEC, including as a red shirt freshman), but most scouts agree he would've have benefitted from going back to school for his senior season. 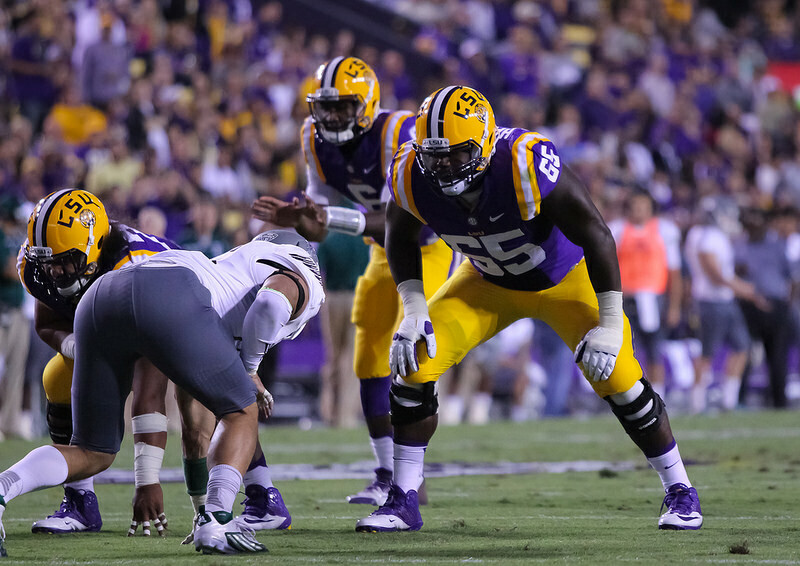 After starting his first two seasons at right tackle, he switched over to the blind side this year to replace the departed La'el Collins in a mostly successful junior season. His solid footwork and excellent length (34 1/4" arms) give him some upside in protection, but his technique is all over the place and he clearly needs a year or two in an NFL strength program. Still, the physical tools are there, and he could be an intriguing middle round prospect for Dante Scarnecchia to develop. While scouts differentiate on which side Hawkins should play on the next level, there is no such debate about Shell. At 6'5" and 324 pounds, the former Gamecock fits the NFL prototype of a big, mauling right tackle, a position he manned for three seasons in South Carolina before switching to the blind side as a senior. Shell doesn't have the foot speed to stay on the left side as a pro, but his massive frame and plus length (34 3/4" arms) make him difficult to get around on the right side, especially when he gets his feet going. While his technique in pass protection needs some work (paging Dr. Scar...), he's pro ready as a run blocker, where he brings considerable power and nastiness to completing his assignments. The Pats anemic rushing offense in 2015 has many fans hoping for the addition of a feature back, either by the draft or free agency. With that in mind, I was somewhat surprised to see they only interviewed two true running backs at the combine. Perhaps they could be planning to add an affordable veteran on the free agent market, allowing them to allocate their draft resources elsewhere, or perhaps they'll investigate the running back class more thoroughly as the pro day circuit gets underway. 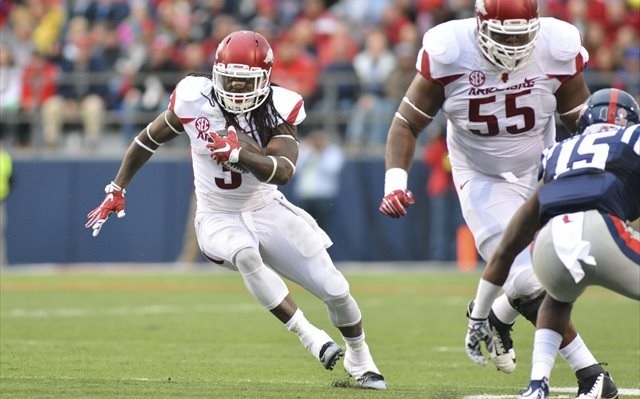 With that said, the most intriguing name interviewed by the Pats in this group was Arkansas' Alex Collins. The former Razorback was remarkably productive and consistent in his three year SEC career, racking up 1,000 yards in all three seasons despite spending the first two in a committee with fellow draft prospect Jonathan Williams. At 5'10" and 217 pounds, Collins is big and durable enough to handle a full workload as an early down feature back. While his combine workout didn't wow anyone, his patience, balance and footwork on tape more than explain his productivity against strong competition. It's unlikely that he'll last to the Pats third round pick, but he could be an option in the second round. However, he'd have to overcome two glaring weaknesses to earn Bill Belichick's trust: a lack of previous experience/usage in the passing game and a history of fumbling. The other running back to get interviewed was Florida's Kelvin Taylor. The son of former Patriot Fred Taylor, Kelvin had a solid career at Florida but his disapointing combine numbers probably pushed him into strictly late round territory. Coaches rave about his work ethic and approach, but at 5'10" and just 207 pounds, he lacks tackle-breaking power inside. His pro ceiling appears to be as a change of pace option in a backfield committee. He's not a true running back, but Kansas State fullback/h-back Glenn Gronkowski merits mention in this space as well. The combine marked the second time the Pats have met formally with the youngest Gronk brother (they also met at the Senior Bowl). While listed as a fullback, Baby Gronk was more of a pass catcher in college than a lead blocking thumper. Presuming the Pats retain James Develin, it's hard to see a role for Baby Gronk here as more than a camp body. Spending back-to-back first round picks on defensive tackles would seem to eliminate this position from early-round consideration, but an exceptionally deep draft class has the team doing their homework in case a prospect falls too far for them to pass up. This position was a strength last year, but Akiem Hicks could depart as a free agent and Dominique Easley remains a major question mark after missing portions of his first two seasons with injuries. Throw in Alan Branch's age (he'll turn 32 during the season) and Sealver Siliga's falling out of the rotation last year, and it's easier to see why adding another talented body to this group would pay dividends down the line. With that in mind, the Pats interviewed five interior lineman in Indy, all of whom project within the "Day 2" range. The biggest name from that group was Florida's Jonathan Bullard, who has shown up in the first round of some mock drafts. At 6'3" and just 285 pounds, Bullard is a bit of a tweener, similar to his former teammate Easley. He's at his best when allowed to shoot gaps, as his 17.5 tackles for loss and All SEC honors as a senior indicate, but his lack of size can be used against him when asked to hold his gap against double teams. It's still early in the pre-draft process, but it would be very surprising to me if Bullard lasts to the Pats first pick. Bullard isn't the only prospect on this list with a Patriots tie-in, as Malcom Brown's old Texas teammate Hassan Ridgeway also had a sit down with the team. Listed at 6'3" and 303 pounds, Ridgeway has an impressive combination of power and explosiveness that gives him 3 down upside at the next level, his skill set is actually pretty similar to free agent to-be Akiem Hicks. Despite that, his college production didn't always match the talent, with conditioning issues and nagging injuries combining to limit his statistical production. Still, there's no doubting whether he has the talent to contribute at the next level, as some scouts think he has more natural talent than Brown did at this time last year. While Bullard and Ridgeway project more as explosive block shedders, Penn State's Austin Johnson appears to be a classic gap-occupying nose tackle. 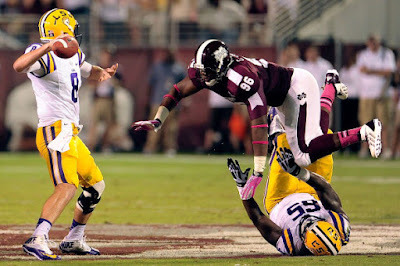 At 6'4" and 314 pounds, his ability to hold his ground against double teams should translate to the next level nicely. He's a good athlete for a man his size, but his strengths still clearly lie in his work against the run on early downs. He's another prospect who should settle in somewhere between the middle of the second round and the early portions of the third, depending on how far teams dock him for a perceived lack of elite pass rushing upside. 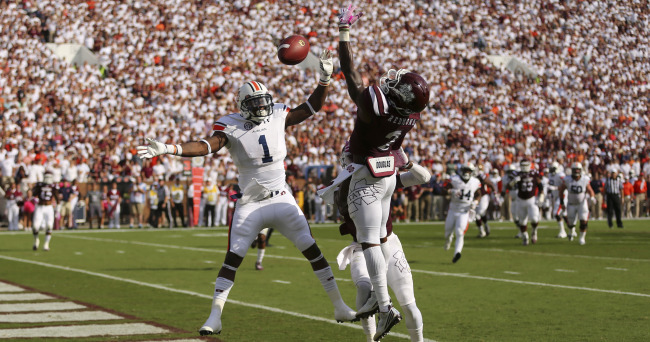 Mississippi State's Chris Jones may now be best known to casual fans as "that guy that fell on the 40 track because his junk fell out of his shorts", but NFL scouts already knew him for his intriguing power and agility. At 6'6" and 310 pounds, Jones has always had NFL level physical talent, but 2015 marked the first time his production on tape matched up to his talent level. When he wanted to, Jones flashed the raw strength to simply dominant his SEC opponents, but sloppy technique prevented his play from becoming even better. Even in an extremely deep class of defensive tackles, he represents one of the highest upside prospects available and could be an absolute steal if he lasts all the way to the Pats pick at 60. The final member of this group, Illinois' Jihad Ward, is a tweener with a ton of upside if the right coaching staff can get their hands on him. A former receiver/safety as a JuCo player, Ward was converted to the defensive line at Illinois, where he had plenty of impressive flashes both at end and tackle. At 6'5" and 297 pounds with special length (33 7/8" arms), Ward could excel as a big, physical run stopping 4-3 end, as a quick penetrating 4-3 tackle, or as a two gapping five technique end in a 3-4. He is still very much a raw project, but his versatile skill-set could make him very intriguing to Belichick, who has always favored big, physical players with length in his front seven. Yes, another position group that was a true strength for this club last season. However, there isn't a ton of long-term certainty in this group, as all three of the team's rotation from last year (Chandler Jones, Jabaal Sheard, Rob Ninkovich) are entering contract years. The team already braced itself a bit for such a doomsday scenario last draft, scooping up Trey Flowers and Geneo Grissom, but those guys are still very much unproven after playing sparingly as rookies. 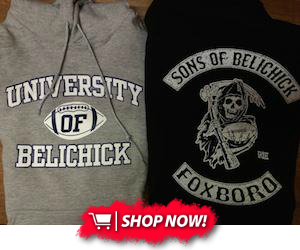 Adding another body to develop for the not-so-distant future could be a sneaky play for the Pats in this draft. His SEC pedigree makes Georgia's Jordan Jenkins the best known prospect of the group the Pats interviewed last week. A productive three year starter in the SEC, Jenkins has prototype size (6'3", 259) and length (34 1/4" arms) to set the edge in the NFL. His lack of dynamic pass rush ability will keep him from getting drafted too high, but Jenkins is a pro-ready edge setter in the run game. He could be a natural successor to Rob Ninkovich, who will be hitting free agency as a 33 year old a year from now. While Jenkins represents a safe, pro-ready option, Boise State's Kamalei Correa is a raw prospect with some intriguing upside as a pass rusher. Correa was productive as a collegiate player, notching 19 sacks and five forced fumbles over the past few seasons, and some scouts envision a high ceiling for him if his technique can catch up to his natural burst and non-stop motor. At 6'3" and 243 pounds, he is on the smaller side, especially for what the Patriots typically look for from their edge defenders. Florida's Alex McCalister could be an intriguing role of the dice with a later round pick, as he flashed some big time ability during a Florida career that was limited by injuries and suspensions. McCalister was a prized four star recruit thanks to rare athleticism (he posted excellent marks in the broad jump, 3 cone drill and 20 yard shuffle) and length (obscenely long 36" arms). However, he faces questions about his frame (at 6'6" and just 239 pounds, he's a true beanpole), inability to stay healthy and two suspensions for violations of team rules, which lead to his dismissal from the Florida program and early entry into the 2016 draft. His troubled career as a Gator undoubtedly received scrutiny from the team's staff during their interview, but his raw physical talent could turn into something if utilized properly at the next level (although adding 20 pounds is pretty much a must to fit the Patriots scheme). Finally, Maryland's Yannick Ngakoue is a prospect whose college production merits a closer look. Ngakoue finished second in the nation with 13.5 sacks as a junior, with 45 additional QB hurries to boot. His burst and athleticism are his calling cards, as he lacks ideal length and power to hold up against the run right away as a pro. Still, there's some pass rushing upside here, and a year in an NFL weight room could make a big difference in turning Ngakoue into a more complete prospect. Off-the-ball linebacker is another need that could be addressed with a draft pick, as the team's lack of depth was painfully evident whenever either Jamie Collins or Dont'a Hightower were forced out of the lineup. However, there seem to be fewer and fewer college prospects available that fit the bigger "thumper" niche the Patriots look for, as evidenced by just two of this year's linebackers weighing in at more than 250 pounds. One guy who certainly fell short of that target weight was Virginia Tech's Dadi Nicolas, who was painfully undersized for the defensive end role he played in college. 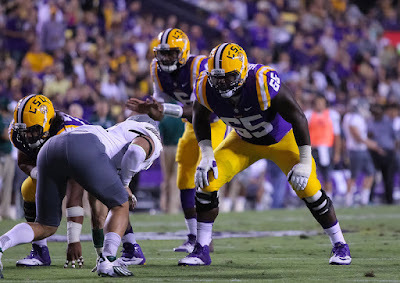 At 6'3" and just 235 pounds, Nicolas lacks the power to translate successfully as an edge defender at the next level, leading to some speculation amongst scouts that he could ultimately convert to being an off-ball linebacker at the next level. There's some athleticism to work with there, but such a raw project would likely be a later round pick, with his early contributions coming exclusively on special teams. The other linebacker interviewed by the Pats this week, Mississippi's C.J. Johnson, is another undersized defensive line convert. Johnson was productive as a two year starter at defensive end, but transitioned to inside linebacker as a senior. There's some athletic potential there and he was a favorite of his coaching staff for his work ethic and leadership, but Johnson projects as a late round project; he's very raw technique-wise as a linebacker and needs to add playing strength to survive at that position at the next level. Fans have been clamoring for this team to add a receiver to Tom Brady's arsenal for quite some time. Brandon LaFell's dud of a season, Julian Edelman's sneakily advancing age (believe it or not, he's already 30) and Danny Amendola's tricky contract situation have done nothing to quell that clamoring, as I've often seen receivers mocked to the Pats with at least one of their top two picks. For that reason, I was slightly surprised to see they only talked formally with two receiver prospects at the combine. It wasn't surprising that South Carolina's Pharoh Cooper was one of the prospects that intrigued them. Like many Patriots receivers before him, Cooper is a guy whose production belies his lack of desired measurables. Not particularly big or fast, Cooper is a gamer whose quickness led to constant production as a Gamecock. Much like the Pats do with Edelman and Amendola, South Carolina found a multitude of ways to get the ball in his hands, where he was consistently dangerous after the catch. He'd add valuable developmental insurance at that all important slot role in the Pats offense, while also having the ability to contribute right away as a return man. The other receiver interviewed last week, Ohio State's Jalin Marshall is far more of a raw project whose selection would be unlikely to pay immediate dividends. Marshall was a 5 star recruit as a high school dual-threat quarterback who struggled with injuries before flashing the past two years as a complementary receiver behind the likes of Devin Smith and Michael Thomas. His athleticism lead to some playmaking traits with the ball in his hands, but he's still very raw as a route runner, which would make him unlikely to see the field early in New England's precision based passing attack.